Can I Sue a Car Dealership for Misrepresentation? If you just bought a car and it’s not working as it should, you may be wondering if you can sue the dealership. If the dealership made a material misrepresentation in order to sell you the car, you might have a case. There are many forms of misrepresentation. For example the dealer may have lied to you about the condition of the vehicle. You may have asked the dealer if your car was ever in an accident. If that car was in an accident and the dealer answered no, that lie is a misrepresentation. Another common misrepresentation is false advertisement, such as bait and switch. You might see a dealer advertise a car for one price, and then attempt to sell it for a higher price or attempt to sell you a different vehicle altogether. Another misrepresentation that you can sue a dealership for is lying about the mileage. Federal and state laws require accurate disclosures of a vehicle’s mileage. If a dealer fails to tell the truth about the mileage, you might be able sue that dealer. There are many more misrepresentations out there and it is something that happens every day. If you feel like a dealer made a misrepresentation please call for a free case evaluation today. My car failed DEQ. Now what? Many Oregonians buy used cars and find out it will not pass DEQ. Frequently, these same buyers ask “is it illegal to sell a car that won’t pass DEQ?” The quick answer is yes, it is illegal. If a dealer sells a used car to someone who lives in a metro area that requires DEQ testing, the dealer must ensure that the vehicle can pass the DEQ test at the time of sale, unless the dealer first discloses that the car cannot pass. 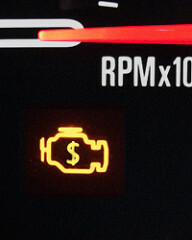 Typically what happens is a consumer buys the car, then a few days down the road the check engine light comes on. When the consumer takes the car in for its DEQ test, it will fail. According to the Oregon Department of Environmental Quality, if a check engine light is illuminated on your dashboard, your car will not pass the DEQ test. Why did the Check Engine light come on after I bought my car? A check engine light can come on for a variety of reasons, but they all relate to something needing attention with a car. If a dealer has a car in his inventory that has a check engine light on, he can simply reset the light without fixing the problem. This will keep the light off until the car completes a drive cycle. The amount of time needed for the drive cycle to complete will vary from car to car, but it is usually long enough for a dealer to sell the car. Frequently these are problems with emission sensors or faulty catalytic convertors, which will require repairs. This practice is illegal under Oregon’s Unlawful Trade Practices Act. Is it illegal for a dealer to sell a car without a catalytic converter? 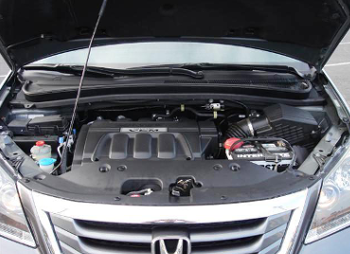 Many used cars are sold with aftermarket parts installed or with modified exhaust systems. This might include a straight pipe, high performance mufflers, or other equipment intended to increase the car’s performance. If the dealer does not disclose that these modifications will cause the car to fail DEQ, that is illegal. It is illegal because a car with faulty emission equipment will not pass DEQ. It is illegal for a car dealer to sell a car in Oregon that cannot pass its DEQ test to a consumer who lives in a DEQ county. If you just purchased a used car and it has failed its DEQ test or the check engine light has recently turned on, please call our office at 503-383-1496 for a free consultation to see if we can help you with your problems. Whether you are a first time car buyer or a seasoned veteran, you want to be equipped and ready before taking on a car dealer. If you are buying a car in Oregon, here are the top 10 things you should remember to do in every used car purchase. 10. Take someone with you. It is much easier for a salesperson to take advantage of you when you are alone because you are more vulnerable to suggestions. Also, if you don’t take someone with you, you don’t have a witness if something goes wrong. 9. Get pre-approved for your loan. Unless you are paying cash for your purchase, you should always check with your bank or credit union to see if you can get a good interest rate before you purchase your car. Dealers employ many different tactics to try to make the most out of the sale, and many of them involve manipulating financing numbers. If you get pre-approved, you take away many of the dealer’s tools to take advantage of you. Also, although it is illegal in many states, many dealers charge a higher price for financed vehicles vs. cash purchase. If you are serious about making the purchase, take the time and spend the extra couple of hundred dollars to take it to your mechanic to find potential problems before you make the purchase. You are already spending thousands of dollars for this vehicle. It makes sense to spend a little extra to make sure you know exactly what you are buying. If your mechanic finds problems with the vehicle, it gives you negotiating leverage if you still want to buy the car. If the dealer will not let your mechanic inspect the car, it’s a good indication they are hiding something. You want to find out who you are dealing with before you even decide to visit the dealership. There are many consumer review websites, such as the Better Business Bureau (BBB), Yelp, Google+, etc. that will give you an idea of what kind of reputation the dealership has. Also, you can look up the dealer on the Attorney General’s website to see if complaints have been filed against them. Here is the link for Oregon: https://justice.oregon.gov/complaints/. Finally, make sure to check out the dealership’s website. Sometimes dealers make all kinds of promises on their website that they may not promise in person. 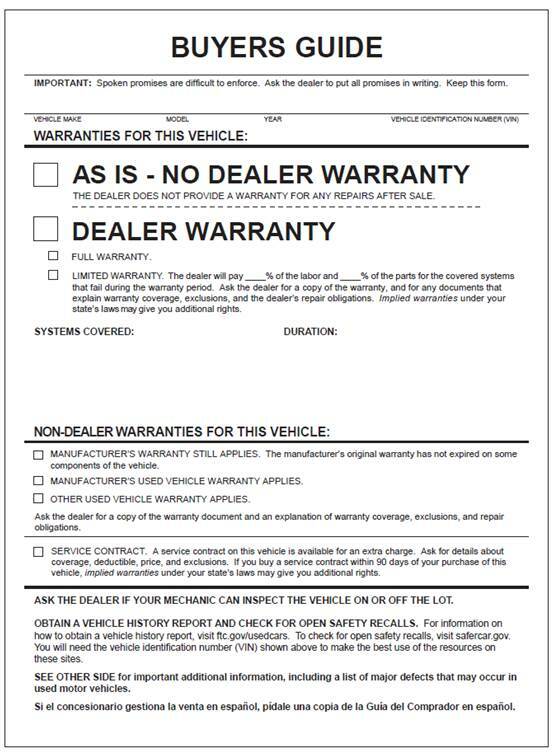 Some examples are “Free CarFax for every vehicle,” “All of our vehicles are fully inspected,” and “We give full warranties on all of our vehicles.” If you find these promises on the dealer’s website, print them out and ask the dealer to honor them. 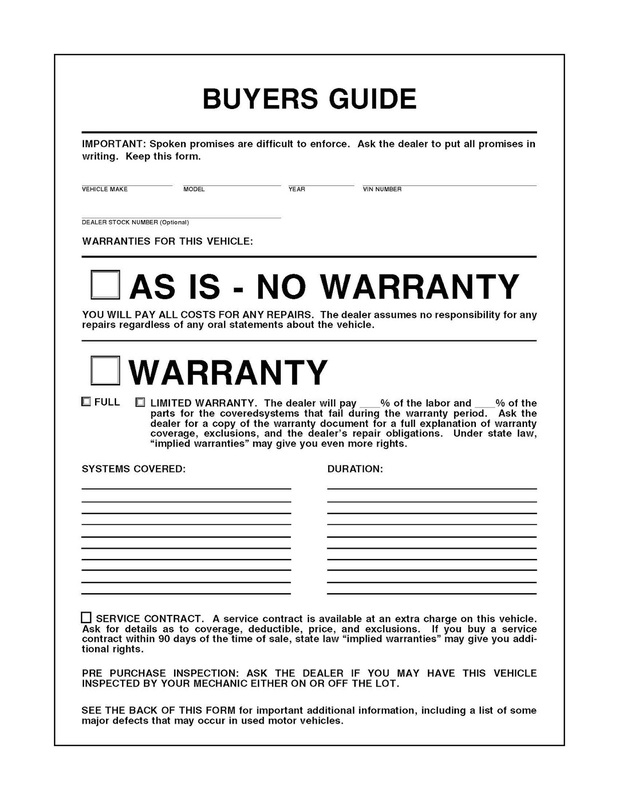 Most dealers run a vehicle history check (either CarFax or Autocheck) on every vehicle in their inventory. It only makes sense to know what they know before negotiating a price for the vehicle. So, don’t be shy about asking for a copy. Sometimes dealers leave out certain information, so you need to get the entire vehicle history. Carfax will report prior wrecks, odometer discrepancies, and service history. But remember, Carfax may not report everything. Just because the the Carfax is clean does NOT mean the car is clean. Carfax is not a substitute for an inspection by a mechanic. Remember, you are buying a car with a mysterious past. Don’t be afraid to ask as many questions as you can think of. What the dealer tells you can become a promise that you can hold them to. So ask about any problems with the engine, transmission, leaks, etc. Ask if the car has been in an accident in the past. Ask whether it was inspected by the dealer’s mechanic. If it was, ask for an inspection report. After hours of negotiating comes the signing of paperwork. Many consumers gloss over this portion because they are exhausted from hours of negotiating. Dealers know this and try to sneak in undesirable terms to your contract. This is when you need to be the most alert. If you don’t understand something, have them explain it to you. Make sure the paperwork accurately reflects what you are agreeing to. Here are some common items to look over. Remember when you asked the dealer all those questions about the car? You can write down their answers on the contract and have them sign it. Also, if you don’t agree with something on the contract, cross it out and write in your changes. Do I really want this car? Are they giving me a fair price for my trade-in? Can I really make these monthly payments? Don’t be pressured to sign anything you are not comfortable with. Remember, you can always walk away. Does Oregon have a 3 day return law for car purchases? If you signed a financing agreement at the dealership, the dealer is likely looking to “sell” the financing contract to a lender under the terms stated. If the dealer cannot find a lender who will approve the financing under those terms, you have the right to cancel the contract. Many dealers don’t know this law, so expect some opposition. They will likely try to pressure you into a new financing agreement with a higher APR and/or monthly payments. If it’s a new car you bought, Oregon’s lemon law allows you to bring the car back to the dealer for repairs. If the problem remains after 3 attempts (or 30 days in the repair shop, or 2 attempts to fix a serious safety defect) you have the right to return the car and get your money back. The Uniform Commercial Code allows the purchaser the right to reject or revoke any good if it does not conform to the contract. So if the dealer promised you a car with a V-6 engine, but you were given a 4 cylinder engine, you may be able to “undo” the contract and get your money back. 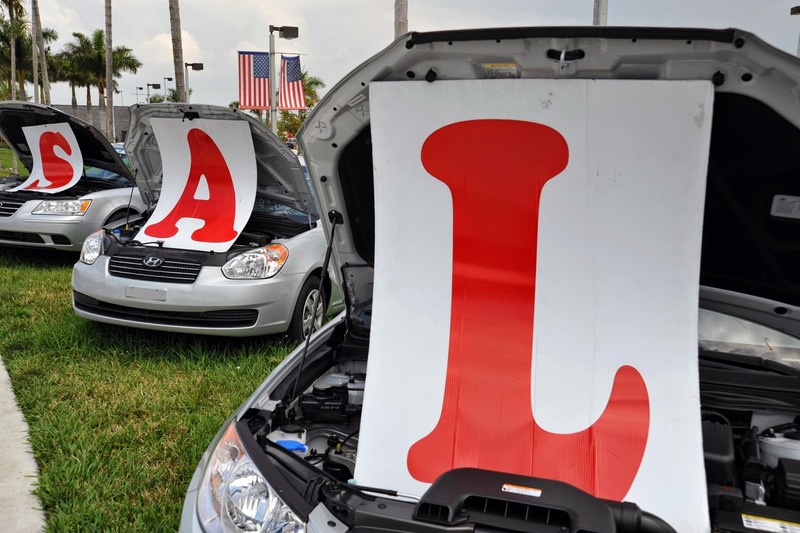 The UTPA provides the consumer with protections against a wide range of deceptive tactics, some of which include lying about quality of the vehicle, and failure to disclose serious problems. Although the UTPA does not specifically provide a remedy to “undo” the contract, if the problem causes severe reduction to the value of your car, you may be able to get a full rescission. Be prepared to face great opposition from the dealer, as they will attempt to hide behind the “as-is” clause of your contract. The best thing to do is to contact an attorney who will know how to handle these situations and help you maximize your recovery. If you are determined to go at it alone, just be prepared for long waits and bitter fights. If there’s one thing dealers hate, it’s taking a car back.